It’s hard to get it all done. Some of the things we do really turn out well. Some of the things we do could turn out better. Some of the things we do go as badly as possible…worse than we could imagine. This blog has become more of a “how-we” than a “how-to”. If you want to defy convention, I want to encourage you. If you want to try your hand at raising a few chickens or pigs, I’ll tell you what I have found works…and what I have found doesn’t work. I like to make specific mention of what doesn’t work so you don’t make the same mistakes. I’m not just spouting off about my experiences/abilities on the blog, I’m sharing my adventure with you…even the bad parts. Now, before we get too far along here, let me reassure you that I’m fine. I’m OK. I’m not frustrated or angry or thinking about quitting. My goal here is not to depress my readership. My hope is that by opening up here I’ll encourage you to keep going. This stuff is hard. You can do it. I’ll get through it. So will you. I do everything wrong. Not just wrong but as badly as possible. Experience is a harsh teacher and I am a slow learner. Let me give you a few examples. Here is a picture of me, dressing a pig. You can see from my sweat that it was hot outside. You can see from the dirt on my back that I carried the pig up the hill on my shoulder rather than kill it in a more convenient spot. If you could smell you would know she peed on my right shoulder as I carried her. I had to remember not to wipe my brow with that shoulder. 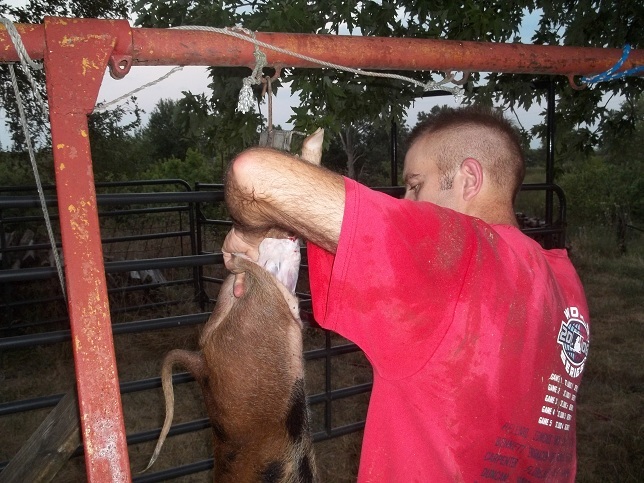 Why did I carry a hog across the pasture on my back and dress it out on a 95 degree evening in July? Because we screwed up. Hot weather is a problem for pigs. Hot weather without water is a serious problem. When I realized what had happened 7 of our 8 pigs ran to the drinker to get their fill. The eighth pig just looked at me. Poor Zing. I carried water to her, attempted to cool her with buckets of water over her body and held the bucket down so she could drink out of it. A few minutes later we lost her. There is an agreement between me and my livestock (and my tomato plants too). I provide everything they need. They provide everything I need. I dropped the ball, I lost a pig. Now, there’s only so much I can do to manage the heat. I can’t save every chicken, no matter how hard I try. There are things I can do to lessen the stress on my animals. Some of it is falling into a routine. Some of it is overcoming personal inertia. More than anything it’s time management. But the truth is I don’t have this all figured out. Some things I do work really, really well. Other things could go better. As I get better I’m more able to manage my time. As I can manage my time better I’ll get more of the things done that I need to do. Please don’t read this blog thinking I have all the answers. I have some answers. I have found some things that work reasonably well. I don’t think I’ll ever exit the discovery phase. I don’t think I’ll ever be “good” at this farming stuff. Not only do I have a lot to learn, sometimes bad things happen. Sometimes the cows get out. Sometimes a raccoon eats a chicken. Sometimes people make mistakes. All of our safeguards failed poor Zing. It was a busy, hot day and nobody checked the water. If there’s a positive outcome here, the next day we wrapped and froze the meat and discovered one of our freezers was beginning to thaw. If not for the pig we would have lost around $1100 worth of chicken.